Articular cartilage damage can result in fragments of cartilage, which detach and exist as loose bodies within the knee. 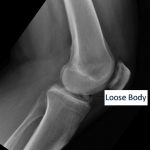 Loose bodies will often cause catching, locking and intermittent swelling of the knee. Knee arthroscopy can be done to remove painful cartilage flaps or loose bodies within the joint. With the removal of a loose body a patient's recovery, weight bearing status and bracing will depend on additional surgical procedures performed or existing injuries. Most patients after knee arthroscopy are able to bear weight as tolerated without a brace.